What Can I do When my Dog Has Mange? There is not a poorer sight than mange in dogs, and as terrible as he/she looks on the outside, they feel the same on the inside. Although mange can come in many different forms, the parasitic mites that are commonly found are, sarcoptic, demodetic, cheyletiellosis and ear mites. 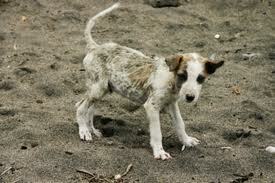 Once you see the symptoms of mange, a visit to the vet is extremely important. They will diagnose the mange and then, depending on factors like age, breed and health level, give you a treatment option to start with. While you are treating your pup, there is more you can do for them than administer the medical treatment prescribed by the doctor. decision. “All-natural” is a term that gets thrown around these days, sometimes it can be used as just a marketing ploy depending on where you go. what position they're sitting, standing or lying in. You can ease a bit of their discomfort by using a mild dog-shampoo. Knowing what is in a dog shampoo that can harm him/her can be tricky. As a general rule, if the name is utterly unpronounceable, it is likely that it is a chemical-based ingredient and has the potential to do more damage than good. Chemical-based shampoos have a good history of drying out skin, which defeats the whole purpose of making Rover comfortable. Hypoallergenic shampoos are probably going to be your best bet, but don't simply spy the label and buy. Turn it over and read the ingredients. Test the shampoo on a small patch of skin before applying. Again, veterinary advice is going to help you make this decision. is still out on whether or not it actually does any good for your dog. Other vitamins that can aid in dog health are vitamin A for immune system, a B complex for metabolism and vitamin E for skin care. Before you make any decision (yup, you guessed it) speak to a professional. If your dog has mange, it might prompt you to keep your distance for the fear of contracting anything. Because a few types of mange in dogs can be transferred to humans, it is wise to ensure that you don't get infected, but a little bit of affection can go a long way. Just as our happiness can determine our health, the same is true for your canine. If the type of mange is demodetic, you can play with your dog without the worry of contracting anything. For other types of mange, the possibility exists to contract it, but if you wash your hands after touching your dog or have a shower after extended contact, you should be just fine. Although maybe giving your dog a five-minute long hug or cuddling with them is probably not recommended, you can still play ball, tug-of-war or any other fun games that will improve his/her happiness. will make you feel better. You'll be aiding along the healing process and take control of the situation at the same time.